By David Fronk 1, 2, 3, shoot! Joe threw paper, Jane scissors, and you stuck with trusty rock. For the umpteenth time, you repeat the ritual in the hopes someone will deviate from their norms and break the cycle. 1, 2, 3, shoot! Same results. With each of you competing against each other, the stalemate continues. No one wins, but no one is knocked out of the game. As infuriating as this might be to imagine, this scenario is a good analogy for how competing species coexist in the environment. When multiple species compete for the same resources, we might expect one of them to evolve an adaptation that gives them a slight advantage over the others. But what happens when this benefit in competing against one organism (like the advantage you have over Jane when your rock smashes her scissors) makes you a worse competitor against the other (like when Joe covers your rock with his paper)? Is this alone enough to keep one species from outcompeting and edging out all the other species in an environment? In their paper “Local dispersal promotes biodiversity in a real-life game of rock–paper–scissors” (Nature, 2002), Benjamin Kerr and his colleges examined the maintenance of diversity using bacteria with a “rock-paper-scissors” relationship. The game starts with three different strains of bacteria (E. coli), each with its own strengths and weaknesses. The aggressors are the toxic colicin-producing strain C, killing neighboring bacteria and moving into the now unoccupied territory. Though deadly, producing this toxin is very costly, and slows their ability to grow. Strain R is resistant to this toxin and grows faster than C, shoving it out of the way as it takes over. And finally, we have strain S, which is fast growing but susceptible to colicin. Even though C’s colicin toxins kill S, S’s rapid growth allows it to easily outcompete R.
The players are all here—now for the field. Kerr and colleagues had three methods of testing bacterial interaction. In the first method, ‘Static Plate,’ bacteria from each strain were grown in the same petri dish until the dish was covered. They then pressed a sterile velveteen cloth to the plate to sample the bacteria, taking a “print” of the exact position of each strain, and transferred the bacteria by pressing the cloth onto a clean plate. After 24 hours, the bacteria had grown to cover the new plate, and the process was repeated. This meant that all interactions between bacteria were local in this method. The second method, ‘Flask,’ had all three strains suspended in liquid media in a flask, with a sample transferred to a new flask every 24 hours. The third method, ‘Mixed Plate,’ had similar growth conditions to the Static plate method but in each transfer the cloth was pressed to the plate multiple times, mixing the bacteria. http://www.youtube.com/watch?v=AM9ZhNXbdZg Check out this simulation to see how the different strains grow on the Static Plate! In the end, only the Static Plate method maintained all three strains over the period of the experiment. Local interactions meant that even as one strain was losing ground in one location, it was able to expand out at another. As susceptible S extended into the Resistant R’s area, R extended into Toxic C, and C extended into S, each strain simultaneously chasing and fleeing the other two. This is like our game of rock-paper-scissors. 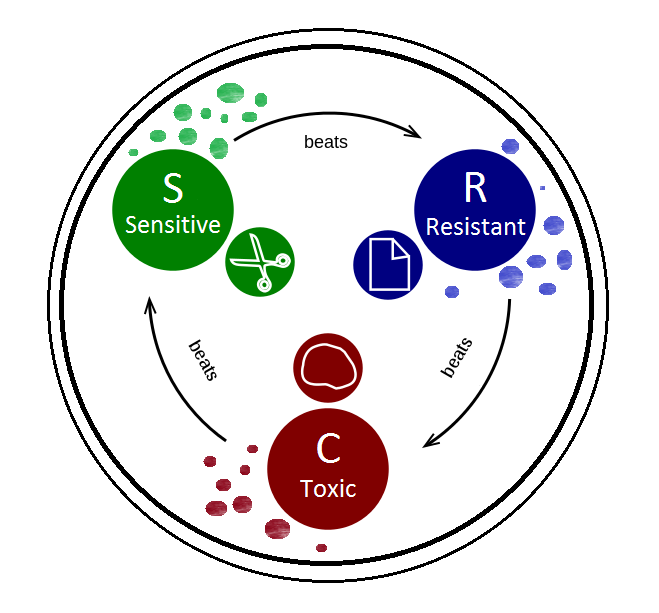 In the other methods, the mixing of the different bacteria meant that the colicin produced by strain C was spread through the media, quickly killing off strain S, after which Strain R went on to outcompete strain C. The analogous situation in rock paper scissors would be if Joe was eliminated after his paper was cut by Jane’s scissors, and then your rock beat her scissors over subsequent rounds. Kerr and colleagues demonstrate that diversity does not just depend on the players involved, but also relies on the structure of the environment. Only when the interactions of each strain were limited to local environments was stability possible. Each strain needed a buffer zone, an area where they were strong and could expand while losing ground somewhere else. The stalemate continues, diversity is maintained, and the process repeats itself again and again. 1, 2, 3, shoot! Next ›Man’s best friend– since when?